Alamance Village Hall is located at 2875 Rob Shepherd Drive, Burlington, NC 27215; phone: 336-226-0033. Photo: North Carolina Highway 62, Alamance Village, photographed by Laura A. W. Phillips, 2006, for National Register nomination document, Alamance Mill Village Historic District,, National Park Service, National Register of Historic Places, #09000599. In 1837 Edwin M. Holt (1807-1884) built a small cotton mill on the banks of Great Alamance Creek in Alamance County, North Carolina. Although it was not the first mill built in the county that became a center of North Carolina's important textile industry, it was the first mill in what became an extraordinary family empire of textile mills during the late nineteenth and twentieth centuries. The Alamance Cotton Mill was also the mill that produced the first colored cotton goods manufactured in the South—the "Alamance Plaids." The Alamance Cotton Mill operated until 1926. After the mill closed, it and the entire village were purchased by John Shoffner and his Standard Hosiery Mills. What had been the cotton mill continued in use for another twenty years as the dye works and then storage for the hosiery mill, which shut down in 1947. As was necessary in rural North Carolina in the nineteenth century, a mill village was built for the workers of the Alamance Cotton Mill who were moving from area farms to work at the mill. The form of the village was typical of countless other mill villages in the state. In addition to the mill, the lower end of the village held the company store, mill office, supervisor's house, and warehouse—those resources that provided manufacturing and management functions. Rising uphill from there along a single road were the workers' houses, identical vernacular dwellings in a row. 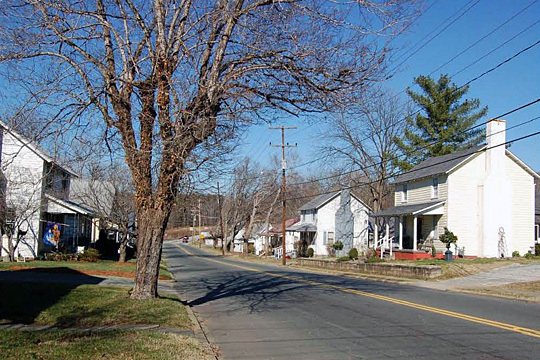 The Alamance Mill Village has groups of houses that span three periods in the development of the village. Between ca. 1860 and ca. 1880, two-story farmhouse-like frame dwellings with side-gable roofs and gable-end chimneys were built. Around 1900 one-story frame houses with three-gable roofs with decorative gable vents were erected, and ca. 1927, one-story frame bungalows with front gables encompassing engaged porches were built. The district also contains three other significant houses that are not part of these groups: one dating from ca. 1840 that may have been the supervisor's house, one dating from ca. 1860, and the last dating from 1929. Today, the Alamance Cotton Mill buildings themselves and the combined company store and office are long gone. However, the impressive stone dam survives as a reminder of the power source that ran this and so many nineteenth-century textile mills. In addition, the one- and two-story frame houses that line both sides of the road leading uphill from the site of the old mill clearly present as a mill village, even though they have not been owned by a mill since the mid 1930s. Moreover, the houses in the Alamance Mill Village exhibit three building campaigns by two different mills, thereby illustrating the longevity and evolution of this particular mill village and the continuity of the way of life it represented for many North Carolinians. Laura A. W. Phillips, Architectural Historian, Alamance Mill Village Historic District, Alamance County, N.C., nomination document, 2007, National Park Service, National Register of Historic Places, Washington, D.C.